After rebounding from 52-wk low of 16170 (4 October 11) to as high as 21717 (29 February 12), HSI (Hang Seng Index) retreated 4.2% to end at 20806 yesterday, after China set a lower target for growth this year, raising fears of a hard-landing in the mainland economy. 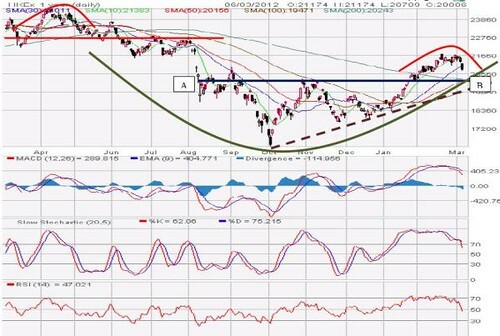 The saucer base rally that started in October 11 is likely to come to a halt, and prolong a downward correction for HSI, reflected by the bearish technical readings and rounding top formation chart. Immediate supports are the horizontal support (AB) near the 200-d SMA (20243), 50-d SMA (20166) and 20,000 psychological barrier. Critical support is the uptrend line (UTL) near 100-d SMA (19471). A breakdown below the UTL (Up-Trend-Line) will spur more selldown towards 18000 levels.